The union’s members have voted in favour of maintaining the USI’s current position in campaigning for fully Exchequer-funded fees. 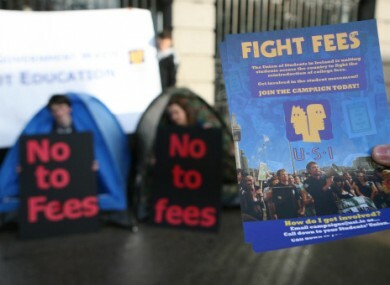 File photo of a USI 'no fees' protest. MEMBERS OF THE Union of Students of Ireland have voted by a slim majority to maintain the union’s policy of seeking free fees for third-level students. The results of a week-long online poll on the issue were revealed at a special congress of the USI in UCD today, with the 100 per cent Exchequer-funded option emerging as the top preference. Support for the Exchequer-funded model narrowly beat student contributions as the most popular option. Disputes have emerged over the poll, however, with NUIG’s delegation walking out of the congress over the passing of a procedural motion to end the debate prematurely and proceed directly to a vote. A number of delegates to the congress had been planning to base their votes on the outcome of the debate, and had not travelled with mandates on how to vote. Speaking to TheJournal.ie this evening, NUIG’s SU president Emmet Connolly described the online poll as a “sham”. He said that a decision had been made among the national executive earlier to hold the vote at a time of year when most students would still be in college. “At this point of the year,” he said, “people are away and you don’t get a representative sample of students [for a poll]“. Though pleased with the outcome of the vote, Connolly said that the NUIG SU feels that it should not have gone ahead in mid-May. The NUIG SU is now considering disaffiliation from the USI and “it will be on the agenda for the incoming SU when they take over in July,” according to Connolly. USI President Gary Redmond disagreed with NUIG SU’s stance on the poll’s timing, saying that the date for the poll was set by the union’s national executive and that it “didn’t seem to cause a problem in a lot of the colleges”. “We’re absolutely delighted with the turnout and with the effort put in by the student unions,” he told TheJournal.ie. The USI president also said that he believes the union now has a stronger position when campaigning over fees because of the result of the poll: ”For the first time ever we were able to ask all of our members across teh country to vote in an online poll and to give their views. The fact that they voted in support of the policy we had in place means we can go to the government” and show this support. Email “Dispute erupts over USI's student fees poll”. Feedback on “Dispute erupts over USI's student fees poll”.